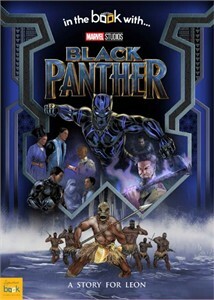 This Personalized Black Panther Book brings the smash hit Marvel movie to the page with your child in the story! T'Challa is the King of Wakanda and the Black Panther, the fierce warrior who fights to protect his people and stop evil. Wakanda is a land rich with resources, and T'Challa's enemies are out to steal the land's precious goods. From being a massive Marvel comic book to a blockbuster Marvel movie, the Black Panther's story has always been one of triumph and valor. Your child's name will appear throughout the story, creating a perfect Marvel gift for Avengers fans. You can also personalize the opening page to have a message for your loved one, making it a one-of-a-kind Marvel present. Gift boxes are also available to purchase with this item. Availability: This Personalized Black Panther Book takes approximately 4-5 business days to leave the warehouse plus transit time.